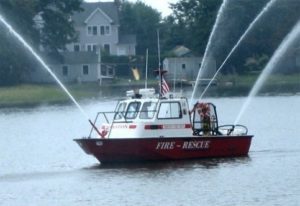 Marine 34 is the only firefighting and rescue capable marine unit in the town of Darien. It allows Noroton to respond year-round to the various types of emergencies that occur on Long Island Sound, including Marine fires, man overboard calls, and search and rescue operations. It also features a thermal imaging camera on board which will aid rescue operations year round.